Welcome to another installment of If My Book, the Monkeybicycle feature in which authors shed light on their recently released books by comparing them to weird things. 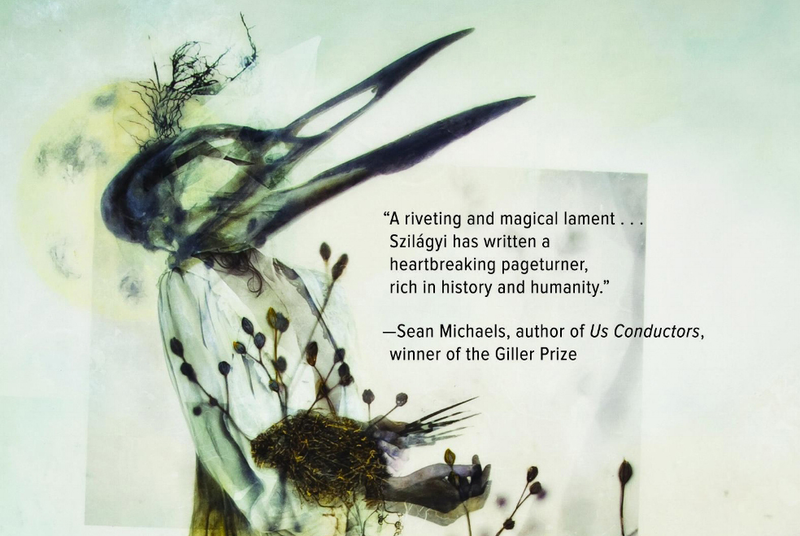 This week Anca L. Szilágyi writes about Daughters of the Air, her debut novel just published by Lanternfish Press. If Daughters of the Air were flowers, it would be tiger lilies, dandelions, and Queen Anne’s Lace. If Daughters of the Air were an opera singer, it would be Klaus Nomi. If Daughters of the Air were perfume it would be ebony, jasmine, and musk, and it may cause a chemical burn. If Daughters of the Air were a zoo animal it would be a manticore. If Daughters of the Air were a type of fire, it would be the hottest blue. If Daughters of the Air were an obscure medical malady it would be a stone baby. Just kidding. Daughters of the Air is the opposite of a stone baby. If Daughters of the Air were a crime, it would be aggravated manslaughter. Also, genocide. If Daughters of the Air were a street in Paris it wouldn’t be a street in Paris. If Daughters of the Air was a kind of bird it would be a scarlet ibis or a bat. If Daughters of the Air were a dolphin it would be a pink one that came out of the water in the day disguised as a human with a jaunty hat to cover its blow-hole. If Daughters of the Air were jewels they’d be emeralds and rubies and you’d put them on your eyes to alter the light but you’d have to squint to keep them from falling out. If Daughters of the Air were an HVAC system, you’d stare at it with trepidation. If Daughters of the Air aspired to be a city, it would be an infinite city. If Daughters of the Air were sad, you could doodle in it to make it happy or at least not as sad. If Daughters of the Air were salad, you’d eat it alone while waiting for the train, flicking out old slimy greens. If Daughters of the Air were a science, it would be alchemy. If Daughters of the Air collided with stars, it would create a black hole, but you wouldn’t get lost in it, Daughters of the Air would help you out onto the other side, I think, though you might get a scraped knee. Daughters of the Air has some iodine for your scrape, and ointment. Be careful when you rip off the band-aid. 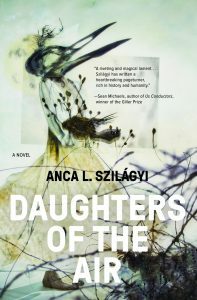 Anca L. Szilágyi’s debut novel is Daughters of the Air (Lanternfish Press, 2017). Her writing has appeared in or is forthcoming from Monkeybicycle, Los Angeles Review of Books, Electric Literature, and Lilith Magazine, among other publications. She is the recipient of the inaugural Artist Trust / Gar LaSalle Storyteller Award, a Made at Hugo House fellowship, and awards from the Vermont Studio Center, 4Culture, the Seattle Office of Arts & Culture, and the Jack Straw Cultural Center. The Stranger hailed Anca as one of the “fresh new faces in Seattle fiction.” Originally from Brooklyn, she currently lives in Seattle with her husband. Find her at ancawrites.com or on Twitter at @ancawrites.